I’m seriously so excited for this latest DIY for Coco – I’ve been looking forward to making it for ages and finally got some time last weekend! As an added bonus, it was honestly so simple, and took a lot less time than I thought it would. 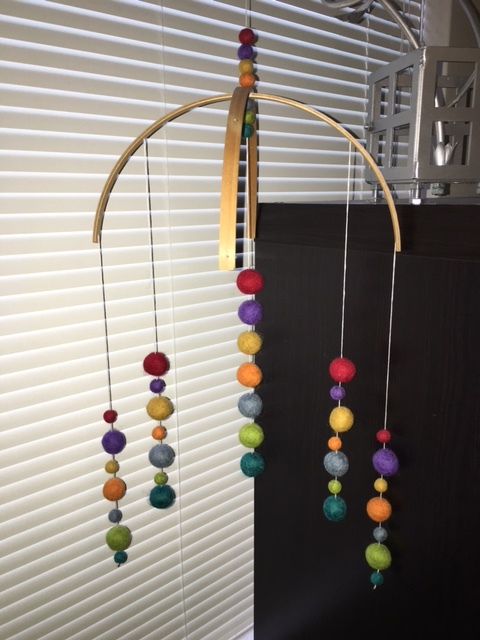 My latest DIY completion is a rainbow felt ball baby mobile which is perfect for a gender neutral baby nursery. 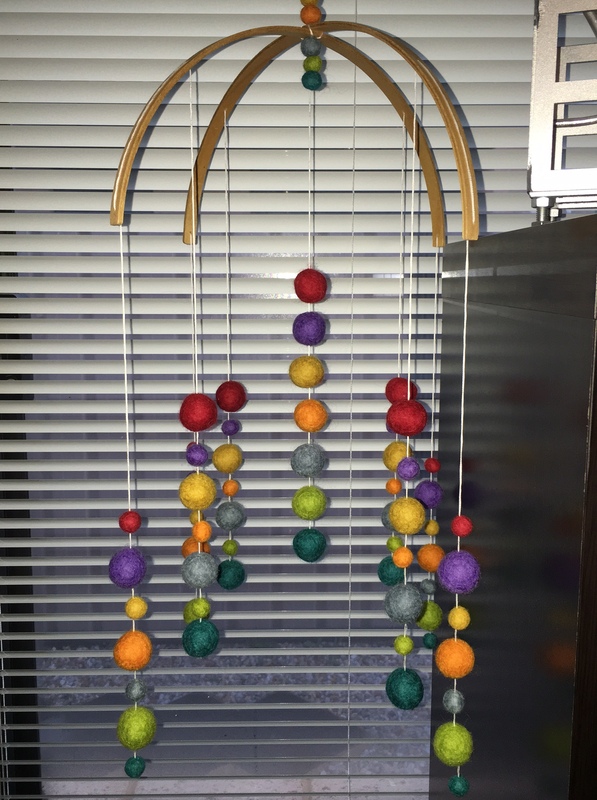 Mr A & I wanted a mobile that was a little different, and I love geometric shapes so inspired by American Etsy sellers I decided to try my hand at this. So a couple of items to note about the materials – I purchased felt balls that were already made, but in my travels I found out it’s quite easy to make your own, so if you’re finding it difficult to find colours that you love, give the DIY felt ball tutorials that are available a go. I also decided on 7 colours because of how many balls I wanted on each drop, but you could change this to be more or less depending on your personal preference. I used a 14″ embroidery hoop, but again, you could change this depending on your preference to make the mobile smaller or larger. The choice of embroidery thread colour is completely up to you also; I decided on white as I liked the way it made the colours pop. Measuring the Drop Holes – Once you have the 2 frames, you’ll mark out 5 holes across the halves which will be your drilling points. I did this by putting the two frames on top of each other, and then calculating 5 holes across the distance of the two frames. The main thing is the 3rd hole along (the one that is in the middle of the frames) should be in the centre, because this is the hole you’ll use to connect the two frames together later, therefore you need it as close to centre as possible. Drilling the Drop Holes – Once your holes are marked out, tape the 2 frames together so that there’s no movement whilst you’re drilling. This will also ensure you get even holes on both frames. I used a very small drill bit, because the hole only needs to of a size to allow 6 strands of embroidery thread to pass through. Drill the 5 holes, undo your tape and then you’re ready to move onto the next step! Assembling the Frame – This is where I started to take photos so hopefully you’ve followed along so far! Once you’ve separated the two, move the bottom one 90 degrees so the frame now resembles those claws in the arcade games that you can never win! I was originally thinking of using a bolt of some kind to connect the two frames, but instead ended up using thread instead to keep the connection ‘soft’. I simply threaded the needle through the hole, then to the left side of one frame, through the middle, then to the right side of the same frame, through the middle, then through the left side of the next frame, and so on. This will make a lot more sense when you do it yourself, but it should look something like this. If you find this part too confusing, securing it with a bolt or with a knot would be fine too – whatever works best for you! 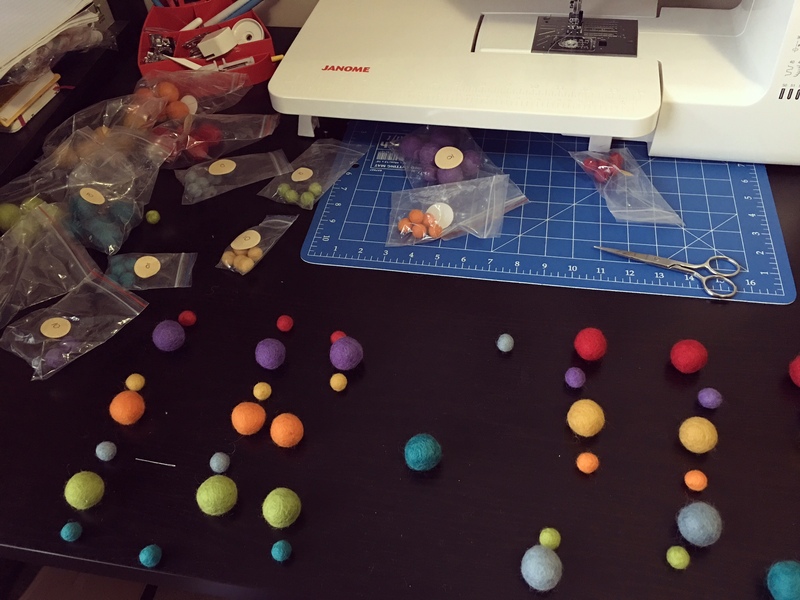 Organising Felt Balls – this is the creative part! 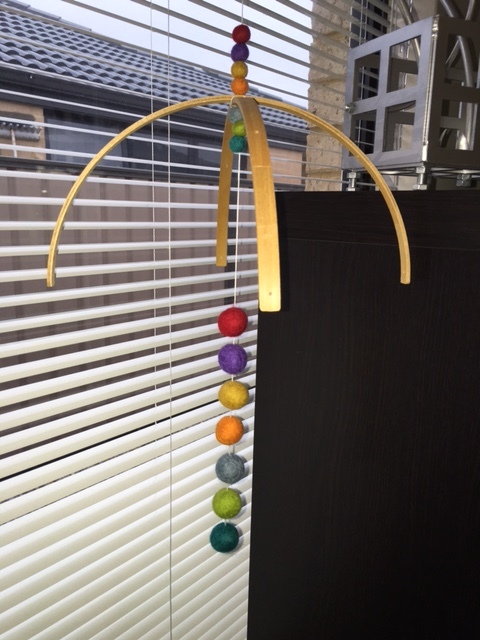 You can arrange the balls however you like; same colours on your drop or alternating colours like I did. I varied the size and colour of each of my balls which you can see here; for example, 4 lengths had large red balls at the top, and 4 had small red balls at the top. Arrange 9 drops in total. 8 will go around the outside, and the 1 left will go in the middle. For the middle drop, I made these all large balls just to vary the drops a little bit, but you can honestly do whatever you’d like – the beauty of this is the freedom and creativity you can express! Threading the Middle Drop – Cut thread for this one much longer than your outer drops, because you’ll use this thread to attach to the roof or baby mobile arm depending on what you use. I cut mine at about 60″ just to make sure I had ample thread to tie off to our baby mobile arm later. Tie a small knot at the bottom and then refer to step 7 below for threading your balls. For my middle drop I used 7 big balls down the bottom, and then tied a knot, threaded 3 of my small balls, passed it through the centre, and then threaded my remaining 4 small balls. Use this thread to secure your mobile to something stable whilst you thread and secure the outer drops. 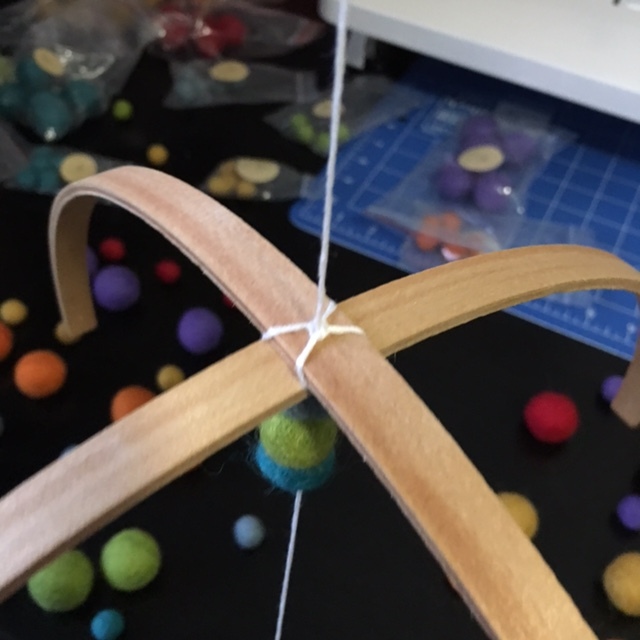 Threading the Felt Balls – If you refer back to my picture up the top, the drops on each frame are on a continuous piece of thread. You could do it this way, or if you find it easier you could do individual drops – completely up to you. These instructions below are for a continuous piece of thread option. First of all measure and cut a piece of thread to the length you’d like. To do continuous drops, my thread length was 36.5″. Cut an additional 3 length of thread to the same size – these will be the thread for your additional drops. Tie a small knot at one end of your thread, and start threading your balls. Yes, it’s really that simple. The felt balls are light and a needle passes through them very easily. I wanted to keep a similar space between the balls, so I used my finger as a guide when threading – when the bottom ball touched my finger, I’d grab a new one and thread through. If you want something a little more precise you could use a ruler. If you do a continuous drop, you’ll thread 1 entire felt ball length, then pass that thread through the 1st hole of 1 frame, then through the 2nd hole of the same frame. You’ll then thread the second drop in the opposite order so that the colours are the same. Once you’ve threaded the entire 2nd drop, ensuring you’re happy with your spacing, then tie a small knot as close to the bottom of the last felt ball as possible. Snip the ends of the thread so you can’t see them. Repeat this process for all other frames and your outer drop will be done. You might need to play around with spacing and adjusting the thread once it’s onto the frame like I had to, because it’s a bit fiddly trying to make sure everything is level and equal as you’re thread. And just like that, your baby mobile is all finished! In hindsight, I really wish I had of taken more photos when I was completing this, but in all honesty, I didn’t think I’d be writing any kind of instructions for it. I hope the instructions have made sense, but quite honestly, once you get started it just kinda falls into place. I didn’t use any instructions when I created mine and I find it easy enough, so hopefully once you get started you’ll find the same thing. It’s quite a simple project and in total, only took me about an hour and a half! Feel free to leave me a comment if you’d like some help clarifying instructions – I know pictures make instructions so much easier. I promise I’ll take some more if I ever make one of these again. I ordered a baby mobile arm off eBay just after I finished this, so the mobile isn’t installed on the cot yet, but I’ll definitely be taking a photo and posting it once it’s in above Coco’s cot! It’s a great mobile, because the colours capture attention and the mobile is so light that it spins and bobs without much effort at all. I absolutely adore it, and because I have some felt balls left over, I’ll likely make a felt ball garland or something similar to match. Mr A & I aren’t finding out the gender of our bundle of love, as we’d like to keep it a surprise until it’s game time! It doesn’t matter to us if we have a boy or a girl; a healthy, happy baby is all that’s on our mind after some health complications recently. 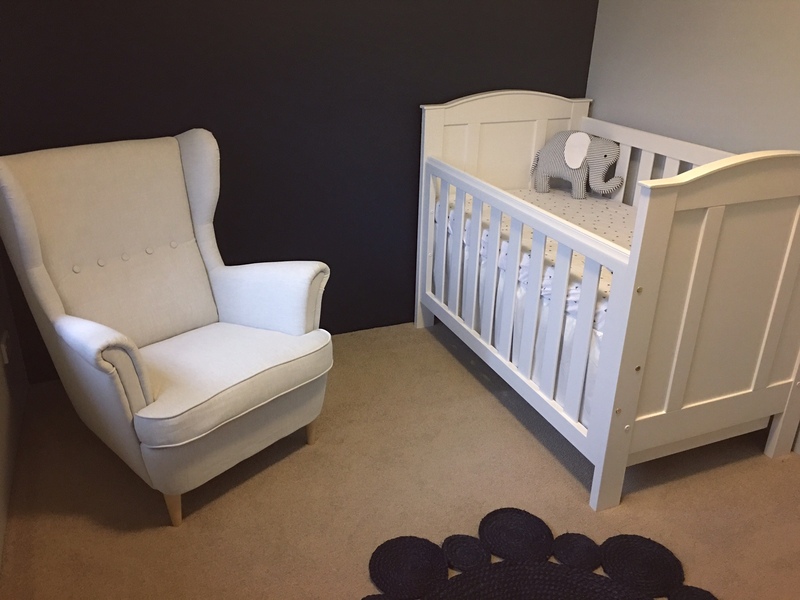 We’ve decided on our gender neutral nursery colours which are navy, light grey and white. Funnily enough, these were our wedding colours also! Here are the paint swatches so you can see the colours we’ll be painting. I love these colours as they have great contrast between each other, and I don’t think they’ll date over time. 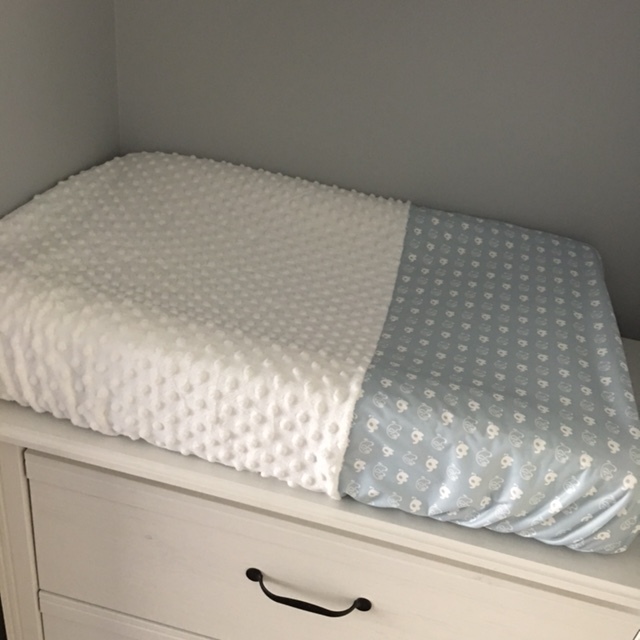 It’ll be easy to add pops of colour depending on if Coco is a boy or a girl, and this is what we’re thinking for Coco’s nursery depending on what we end up having! Depending on the gender of Coco, we’ll be adding in pops of lime green or coral in the form of furnishings and perhaps wall decals. Mr A & I bought paint on the weekend, so we’ll be starting our nursery makeover shortly and I can’t wait! We’ve already purchased an amazing nursing chair which we’re going to DIY into a rocking chair (there will definitely be a post about this! ), and the curtain rail, curtain and dresser which will double as the change table. Things may be a little quiet around here as we undertake some DIY projects and I finish up my last Harry Potter cross stitch, but I’ll keep those of you following along with our projects updated on the progress.